We left off with Russ Hamilton looking down at his hole cards, heads up against Hugh Vincent in the WSOP Main Event in 1994. The hand that won Russ the tournament was pocket queens, just as it was predicted in the mysterious note a stranger had handed him ten minutes before the tournament started. Said the note: "When you get a pair of Queens, the tournament will be over." The more any of us think about the odds or phenomenon of this note, we can only wonder what thoughts were going through Russ Hamilton's mind the moment he looked down, playing heads-up, and saw he had pocket queens? Not once did Russ see Q-Q at the final table until that magic moment happened, which effectively ended the tournament. Russ had a $20,000 tip ready to hand the guy, but he never saw him again! Russ feels to this day, his fate was guided by his late Mom, somehow, who knew how important winning the Main Event was for her son to win. Russ won $1,000,000 in cash, a WSOP gold bracelet, and 43 bars of silver! Jack Binion came up with the brainstorm of paying the winner his weight in silver, to pay tribute to the silver (25th) anniversary of the WSOP. Traditionally, Jack waited until the tournament was down to heads-up to appear, so he could be there for the payoffs. When he got the call in 1994, he didn't ask the names of the two players or chip counts. Instead he quickly inquired, "How much does each weigh?" The voice on the other end said, "Well, one guy weighs about 145 pounds and the other guy weighs over 300 pounds!" Jack said, you've got to be kidding me… I'll be right down there!" You almost have to know Jack to appreciate this story, as he is known for being a little tight, and he had to have wondered what this was going to cost him… the winner's weight to be paid in silver bars! When Jack arrived, he got the report that Russ weighed 330 lbs! The scale brought in for the awards ceremony only went up to 300 lbs. After Russ won the title, with the world's poker media gathered around, he got up on the scale to weigh in and the scale went "Clunk," right to the floor! A voice came from the audience, "What do you have in your pockets Russ, rocks?" Everyone got a good laugh out of the unfolding scenario, including good-natured Russ. The silver bars used to counter his weight fell way short, and a lot more had to be brought in to balance the scales. Besides the $1,000,000 in cash, Russ collected 43 bars of silver that added up to an additional extra $28,000. This was quite a nice bonus. Russ told me when I interviewed him last week, "Tom, I only told Jack I weighed 330 lbs., but the truth was in those days, I really weighed 360 lbs.! I was too embarrassed to admit it, though, so I probably cost myself some money! Every once in a while I'll run into Jack Binion at an airport or function and he'll always laugh and tell the people with him, 'That's Russ Hamilton, the poker player who won the WSOP, and I had to pay his weight in silver in 1994, celebrating our Silver Anniversary! Of course Russ had to wait to lose his weight later on in life!'" Russ laughs as he continues, "Jack still owes me 30 lbs. more of silver if he wants to pay me, because I really weighed 360 lbs. when I got weighed for the silver in 1994." I asked, "Russ, do you still have any of the silver bars left?" Russ replied, "I have one left I keep in my safe at home as a memento of one of the best memories I'll ever have! Before the Main Event started, I had mentioned how sick I felt when I was the chip leader in the $2,500 buy-in Pot Limit Omaha event. We made a four-way deal for the money, and I just wanted to get home as fast as I could. I felt terrible, and the bracelet didn't matter to me. However, when I won the Main Event, I had just the reverse feeling. This was symbolic of poker history, the highest achievement any player could ever reach! Winning that bracelet meant more to me than any prize money I could ever win! In fact you couldn't have forced me to take all of the prize money together, in place of the bracelet. The WSOP Main Event isn't just a bracelet…………It is The Bracelet!" 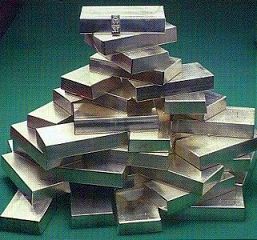 Russ Hamilton's 43 bars of silver. After listening to the amazing role Russ felt his mother Emma played in him reaching his lifelong dream, one could only surmise every time Russ looks at his gold bracelet when he wears it, he feels extra close to his beloved Mom. It is hard to measure the intrinsic value the WSOP gold bracelet truly brings Russ, versus any prize money he might have garnered in winning the WSOP. Money comes and goes, but special moments in our lives remain forever. Russ's Mom, Emma, passed away around 1991, and his Dad, Russ Sr., passed away several years later. It is nice Russ's Dad got to witness his son claim his dream, as Russ Sr. joined his son, wife, brother, and close friends downstairs in the steak house to celebrate the great victory! For extra insurance, Russ's Dad will be able to deliver the good news to his wife. They are both buried together, and when Russ visits them he says his Dad's tombstone has two 88's on it. He is not sure if it is the number of the lot or what, but every year in the WSOP Main Event, he says he is looking for those two 88's. If Russ Hamilton beats out over 8,800 entries plus in this year's WSOP on the final hand with pocket eights, we'll have another incredible story! As I sat in Russ Hamilton's office interviewing him, I noticed two big golf course pictures on the wall behind him. I said, "Russ, are there any special meanings behind those two golf pictures behind you?" His answer surprised me, because the pictures were of two famous golf holes in Augusta, where the Masters is played every year. As it turns out, Russ can safely say he accomplished something on the world's most famous golf course that no other human being on the planet has ever accomplished on the 12th and 18th hole, including all the pros that have ever played in the Masters in its glorious history! Russ was invited by his friend, Denny Mason, to fly in on a private jet to play a round of golf at famous Augusta National, and when they approached Amen Corner, which is holes No. 11, 12, and 13 something amazing happened. Before I tell you what Russ did that day that was so unique, let's go back in time 50 years ago to the year 1958, and find out why those holes are referred to as Amen Corner. The answer centers around what happened to Arnold Palmer, generally considered the king of golf. On Saturday night in April, 1958, the night before the Masters' final round, a heavy rain soaked the entire course. For Sunday's final round, a local rule was adopted, allowing a player whose ball was embedded to lift and drop it without penalty. When Palmer hit his ball on No. 12, it went over the green and embedded into a steep bank behind it. The designated official on the hole ruled Arnie could first play his ball as it laid, and that he could play a second provisional ball, after lifting and dropping it. Arnie shot a five (or double bogey) on the embedded ball, and scored a par three on the second ball. On 13, still unsure what score would be ruled his on No. 12, Arnie eagled 13 with an 18-foot putt! By Hole 15, a committee member approached Arnie and informed him his drop was proper and the par-three score would be counted on his official scorecard. This led to Arnie's first Masters victory in 1958, two strokes better than runner-up Ken Venturi. Legend has it that Venturi and Palmer had heated words in the clubhouse over this ruling on No. 12, and to this day Ken is unhappy about what happened. Okay, so much for our golf lore lesson for today. How does all of this apply to our beloved World Poker Champion, Russ Hamilton? Russ had been invited to join his friend, Denny Mason, and Frank Broyles, former Arkansas head football coach two months earlier to play at Augusta. Russ couldn't make it due to a prior obligation, as much as he wanted to play at famous Augusta National. Frank and Denny decided to invite Russ two months later to join them for another round at Augusta. Russ was thrilled to get to play the course with his two friends. During the round as they were approaching No. 11 on Amen Corner, where golfers know to say their prayers, before disaster ensues…. Russ's friend, Denny Mason, explained that two months earlier when they played before, he had been requested to sprinkle a close friend's ashes into Rae's Creek, which runs in front of No. 12. Incredibly, after Russ teed up on the par-four hole, he struck a perfect shot that won a good-sized bet for a hole-in-one! As the three of them crossed over the Hogan Bridge over Rae's Creek, Russ starts laughing telling Denny Mason, "Maybe your friend in this creek is making you pay back for all the money you beat him out of in golf when he was alive!" Yes, that happening was a little eerie, but so was what happened later in the round at No. 18, as Russ wasn't done with his performance that day! On Augusta's famous No. 18, Russ hit a perfect drive. He said, "I was too far away to get to the green with an iron, so I used my driver for my second shot from the fairway. I hit the green, and decided to putt with my driver. I ended up making a par four on No. 18!" Russ's assigned caddy was simply amazed! At the end of the round, the caddy asked for his autograph. Russ said, "You want my autograph for the hole-in-one on No. 12?" The caddy responded, "No… I've seen a lot of holes-in-one, but I've never seen any golfer in Augusta's history make a par on 18 using his driver only! That was an absolute first!" Imagine the feeling Russ must get every April when he pulls a seat up to watch golf's greatest event, the Masters. He must be thinking to himself, "Just do what I did. If you do get a hole-in-one on No. 12 at Amen Corner, just pull your driver out to finish No. 18 in grand style. The TV commentators would have to go back in the golf history books to find out who ever pulled that impossible feat off! The answer they'll find is: Nobody else in the world... except the 1994 WSOP Champion, Russ Hamilton!"